Legislative decisions made at the local, state and national level can determine much of the way you run your pharmacy business. And, you can impact how those decisions are made. However, your elected officials can only represent you when they understand that filling pill bottles is only a small part of your job. They need to recognize the essential care you provide that optimizes patient medication therapy and promotes wellness and disease prevention. The passage of California Senate Bill (SB) 493 — legislation introduced in February 2013 to enable pharmacists to practice to the full extent of their training and education — provides an example of how getting involved can make a difference. California pharmacists understood the importance of educating government officials and the public on the essential role they play on a patient’s collaborative healthcare team. They also highlighted the critical function pharmacists can have in reducing strain on the already strapped California primary care workforce as it prepares for the 2014 implementation of the Affordable Care Act (ACA) and the influx of millions of patients with a pent-up demand for services. Getting more involved in California state pharmacy organizations. Collaborative efforts by the California Pharmacists Association and the California Society of Health Systems Pharmacists were critical. Members utilized the SB 493 fact sheets, talking points, online grassroots advocacy action center, and other advocacy tools to concisely and quickly ground themselves and those they were educating on the facts. Members volunteered for committees and events. They made financial donations to the affiliated Political Action Committee (PAC) and Pharmacy Legislative Impact Fund. Plus, many pharmacists joined these organizations for the first time, recognizing that numbers speak loudly to elected officials. Direct outreach to government officials. Pharmacists and pharmacy students sent hundreds of simple, well-crafted emails and letters to lawmakers clearly stating their concerns around the provider shortage and how giving pharmacists a greater scope of practice could ameliorate the situation. Owners invited local and state officials to take short tours of their independent pharmacies. Other pharmacists hosted meetings at their homes or community centers so that representatives could hear from patients and providers speaking directly to the important role that pharmacists play in providing care. Rallies are also an impactful way to make a statement. On April 16, 2013, a sea of over 600 white coats descended on the State Capitol in Sacramento for California Pharmacy Legislative Day. Engaging the public. Pharmacists wrote editorials for their local papers, posted social media posts, and created blogs to engage as many people on the issue as possible. They signed petitions to recognize pharmacists as health providers. And, they took advantage of other social events (e.g., dinner parties, book clubs, etc.) to educate on the issues (since you never know who can become a useful ally). Expanding scope-of-practice laws to broaden the services that pharmacists can provide is an important step in addressing the country’s looming physician shortage. The information provided here is for reference only and does not constitute legal advice. We make no representations with regard to the content’s comprehensiveness. You are solely responsible for investigating and complying with all applicable laws that govern the operation of your business. 1 Governor Brown Signs SB 493, Business Wire, California Pharmacists Association, October 1, 2013. 2 Recent Studies and Reports on Physician Shortages in the U.S., Center for Workforce Studies, Association of American Medical Colleges, October 2012. 3 CBO’s Analysis of the Major Health Care Legislation Enacted in March 2010, Congressional Budget Office, March 30, 2011. 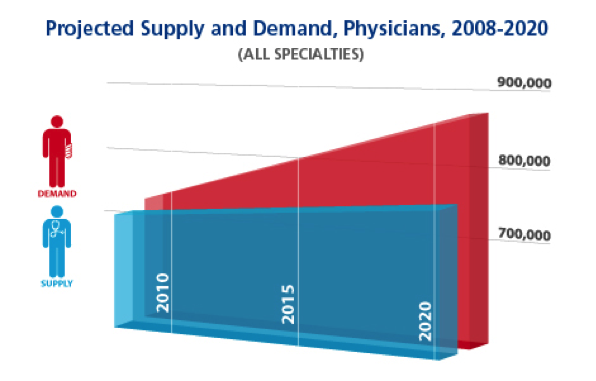 4 Projected Supply and Demand, Physicians, 2008-2020, Association of American Medical Colleges. 5 Scope of Practice Legislative Database, 2011-2013, National Conference of State Legislatures, Online Data updated April 1, 2013.